Grits are ground from hominy, which is made from the varieties of corn with hard kernels. The kernels are dried on the cob, then removed and soaked in a solution of wood ash (although baking soda and lime can be used) which causes the kernels to swell and soften. Then the kernels are hulled and dried; afterwards the hominy is ground and the result is grits. This process causes the protein value to be decreased, but lysine and tryptophan are increased. Without this process of using wood ash, however, pellagra (a deficiency of tryptophan and niacin) can occur because the food becomes deficient. Obviously, tribes learned that to use wood ash would increase the nutritional value of the corn. Grits are popular in southern states; there are hundreds of recipes featuring grits and just as many southern towns that host grits festivals. It is interesting to me that many people I know have never heard of grits. The basic way to eat grits is not to buy the store-bought packages (like the oatmeal packs). The best are the freshly milled grits usually obtained from a health food store. Add grits, water and seasonings to pot. Stir well, cover tightly and cook over low heat from 45 minutes to an hour and a half, or more, depending on the coarseness of the grits. You will need to check them often to make sure they don’t scorch. Add more water if they become dry. When the grits are soft, add the fruit and serve. The options for preparing grits are endless; you can add all kinds of sautéed chopped vegetables and meats to the cooked grits. Add all ingredients to the Crock Pot and cook on medium for 4 hours. While other families were eating cookies and sweet rolls on Christmas mornings, my Aunt Billie Mills made cheese jalapeno grits. Put cooked grits into a bowl and add chopped jalapenos and cheese. Stir, then put grits into a square cookie pan and refrigerate until set. Slice and serve like you would brownies. You also can eat the hot grits in a bowl instead of chilling. Most people love mashed potatoes, but they love them with heavy cream and butter. Those dairy products unfortunately render the dish very high in calories and fat. This recipe is simple. By adding more herbs and spices the potatoes are still tasty, but with far fewer calories. For smooth mashed potatoes, use the starchy Yukon Golds. You don’t have to remove their skins. Peel the potatoes and remove the eyes. If you want the skins on for nutritional value, then only peel half the potatoes. Cut the potatoes into small chunks. Add potatoes to large pot and fill with water until it covers the top of the potatoes. Add turkey broth to potatoes and use a masher to create the desired consistency. If you want thinner mashed potatoes, add more broth. The roots look like long sweet potatoes and the seeds like small round chestnuts. Large quantities of yonkopin roots are pulled up in the fall and eaten raw or boiled if they have been dried. 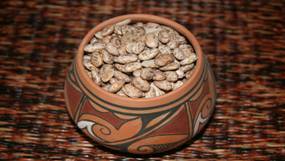 The yonkopin seeds are collected and eaten raw or dried and stored for later use. To process the roots for storage, scrape the outer skin off the long root. The bare root is then cut into 1 or 2 inch pieces and strung together by thongs in 30 piece strands. The strands of yonkopin roots are then hung up outside to dry on wooden frames like those used for jerking meat. To prepare the dried root, boil until tender and add salt. A crock pot of pinto beans is a winter staple. If you make too much, you can always freeze the leftovers in small containers for individual servings. Beans are a wonderful all around food that has no cholesterol, and is high in fiber, folate, protein and other vitamins and minerals, but low in fat and sodium. Soak dried pinto beans in large pot over night (placing beans in a spaghetti colander then putting them in the pot of water makes it easier to drain). In the morning, rinse and drain then place ingredients in crock pot along with chicken broth and spices. The longer you can cook this, the better the beans taste. Serve over corn bread and top with salsa and shredded cheddar cheese. For all of these recipes, pick pumpkins that weigh approximately 1 pound. Sugar pumpkins are of good size. You can also eat the meat of the pumpkin along with the inside ingredients. It is especially tasty with additional sprinkles of garlic, onion and/or chili power. Try chopped sweet tomatoes or a small amount of brown sugar. This is a perfect dish for anyone who cannot digest gluten or wheat, or for anyone counting calories. Although this does not taste exactly like pasta, the texture and appearance is close. Add spices and you’ll have a meal more nutritious than a plate of real spaghetti. Place squash in 13 x 9 baking dish. Add one inch of water. Bake at 350 degrees for 45 minutes to 1 hour or until tender. Using fork in scraping motion, slice squash in half, remove seeds and remove squash from shell (it will come out in spaghetti-like strands). Fluff squash with a bit of olive oil or vegetable stock (some recipes call for butter). This is another good recipe to ensure your family gets their Vitamin A and C and when you have too many peppers in your garden. A week after the monsoons arrived when I lived in Flagstaff, I almost drowned in squash and bell peppers. Place peppers in a pan deep enough to cover the peppers. Fill the container with water until the peppers are covered. Put on the stove to bring the water to a boil, then simmer for about 20 minutes, or until the peppers are softened (but not soft enough to split). While the peppers are softening, sauté the meat, mushrooms, rice, onions and salsa in a pan until meat is brown. Place peppers in a baking dish and add stuffing mixture to the empty peppers. Add some of the mix around the base of the peppers to make sure they stay soft. Depending on your caloric intake for the day, you can add some grated cheddar cheese over the top. 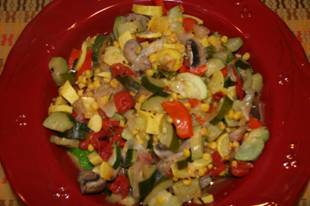 Succotash is primarily comprised of lima beans (Native to Peru) and corn. EuroAmericans altered the recipe by cooking the vegetables with lard, meat drippings, and/or butter. There are many variations on how to prepare succotash; I prefer the optional method below. Cook the lima beans and the corn in separate pots of boiling water until tender, then drain. Put the beans and corn together in one pot along with turkey stock and cook on medium for about five minutes. My daughter loves sweet potatoes and this is the way she eats them. Although she insists on using a sprinkle of brown sugar, I refuse to argue with a kid who loves a food so full of vitamins A, C plus niacin and potassium. Scrub the skin of the potato (no need to peel it) and poke a few holes in it with a fork. Wrap in foil and bake at 350 for 30 minutes. Or, microwave (without foil) for 7-10 minutes or until soft. Cut open and sprinkle with brown sugar. I think the potato is sweet enough by itself. Spray a non-stick pan with Pam vegetable spray or drop in a few tablespoons of vegetable oil. Cover the pan with one layer of vegetables, sprinkle with a favored condiment such as pepper, garlic, oregano, etc., then cook over medium heat and turn after two minutes. Turn to low, cover and simmer until vegetables are tender. These vegetables also work well in a George Foreman grill. Spray the thin-sliced vegetables with PAM spray and sprinkle with spices before cooking. Each spring Choctaws head out to look for the 6 to 12 inch stems of wild onions that feature one-inch wide clusters of small white blossoms. Wild onions go into a variety of dishes and you can decide what you like best. I prefer them on top of baked potatoes, with scrambled eggs and mixed with squash. In heated frying pan or skillet, cook the onions in the stock until the water is almost gone, then spray with PAM or butter and add desired seasonings (pepper and garlic is what we use). Add stirred eggs and cook until done, or add just the onions to your other dishes. Boil the water in large saucepan or a pot. Add rice to boiling water, bring back to boil. Corn and most of the dishes we can create with corn are at the top of my list of food favorites. What I like the best about tamales is the corn, not the filling. Banaha is similar to a tamale, but with no filling. Boil corn shucks for ten minutes. In a large bowl mix together the cornmeal, soda and salt until it is doughy. Roll into longish shape that will fit into the corn shucks. Wrap the shucks around the dough and tie with a shuck string, then boil in pot of water for 30-40 minutes. We eat it with salsa on top. To make banaha more interesting, I add a variety of things to the cornmeal mixture: chopped onions, *green sweet peas, *spinach, *garlic, pepper. I prefer to boil the banaha in unsalted *turkey, chicken or vegetable broth instead of water for added flavor. Corn bread goes a long way in our house. We put it in a bowl and pour pinto beans or chili on top; we match it with yogurt and fruit for a dessert, use as a “side bread” with almost every entrée. Traditional con bread is different from bread made with milk and eggs and that is how we prefer it. This is, therefore, a “semi-traditional” dish. Pour into 12 x 8 pan greased with non-stick vegetable spray. Bake 25 minutes at 400 degrees or until knife comes out clean. Instead of covering with butter, drizzle honey on top. This is a bread, but like the Everything Salad, it actually can suffice as a meal. In a skillet or frying pan, sauté the turkey until brown along with spices. Mix together the turkey with the other ingredients and form into desired shape (balls work best) and drop into boiling water. Using a spaghetti pot with a colander that fits into the pot makes it easy to drain—just lift the colander out after cooking and hold over the sink to drain. 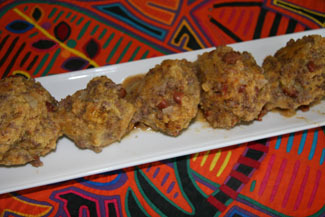 Serve with a salsa or marinara spaghetti sauce. This dish is nice paired with the vegetable sauté. There are two ways to make these: the first is easy because you simply take corn tortillas from the store, cut each into strips or into pie-piece-shaped wedges and spray each lightly with cooking spray (PAM is what I use) and sprinkle with spices such as garlic, salt, cumin, etc., then place on cookie sheet and bake at 350 degrees or until tortilla chips are brown. Another option is to grow and grind your own corn. Stir together the masa harina and salt in a bowl. Heat the shortening and water in a saucepan and bring to a bowl; stir until melted. Add the melted mixture to the dry mix and blend either with a fork, or use a pastry blender. Put mix onto floured cutting board and knead for 5 minutes. Put one portion at a time between the waxed or parchment paper and use rolling pin to roll out dough until it reaches 6 inches across. Heat a large skillet on high until pan is hot. Take one rolled-out dough-piece at a time and put in skillet. Cook on each side for about half a minute or until brown. Place the cooked tortillas in a tortilla warmer or inside warm towel until ready to serve. My cheap blender has lasted almost daily use for over a decade. This is a great drink on mornings when you’re not really hungry but need something, or when you’re not feeling well. I make one at least four days a week. 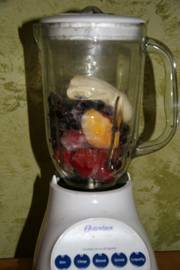 I use frozen fruit, then allow the fruit to thaw slightly so my blender blades won’t get stuck on the hard fruit; slightly frozen ingredients makes a colder, creamier smoothie. These desserts are perfect for any time of the year. They are sweet, filling and full of vitamins and minerals. You can prepare a larger amount of fruit on Sunday and have it for the next three days. Chop fruits into desirable pieces (cubed, sliced, etc.) and put in large serving bowl. Cover leftovers tightly and refrigerate. You’ll need to eat it within two days. There are many variations of the dessert on the web, but this recipe tries to keep the focus away from fat and sugar and to focus on the fruit. 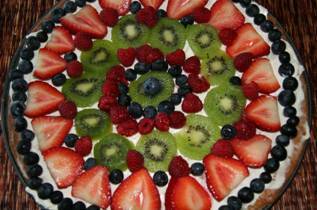 My 11-year-old daughter, Ari, created this cookie, topped with blueberries, strawberries, raspberries and kiwis. Allow cream cheese and cookie dough to warm to room temperature. Cook in 350 degree oven until dough turns light brown—only about 5-9 minutes. Remove and let completely cool. Mix cream cheese with lemon juice until the cream is smooth. When cool, spread the cream cheese over the top of the cooked dough. Use your imagination to decorate the top with the sliced fruit. Cover and refrigerate until ready to serve. 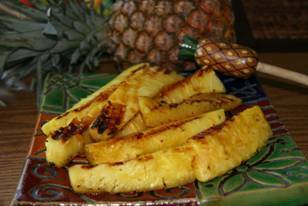 Grilled pineapple is an easy, sweet treat and you can quickly prepare it to cook after the steaks are done. This can be served as a separate dessert, or along with your meat dish. Cut the fruit down the center lengthways, then quarter it. Cut off the tough skin. You may need to use the end of a potato peeler to dig out the embedded eyes (although fingernails work, too). Marinate the slices in a large bag or bowl with one cup of maple syrup. Soak the fruit for at least four hours, but no longer than 24 hours. Place on hot grill; cook each side for about 1-2 minutes. Many like this with ice cream, but it is perfect by itself. Go to the woods and collect as many persimmons as you can. Build a fire. Using a small woven screen made from saplings, separate the seeds from the pulp. Do this by grating the persimmons against the screen, this causes the seeds to fall through the screen leaving the pulp behind. Mold the persimmon pulp into small cakes. Take a wooden drying board, about 9 inches wide and 18 inches long with a handle, and apply buffalo grease. Layer three or four persimmon cakes on the drying board and hold over an open fire until the first persimmon cake layer is about cooked. Then remove the cake and cool. When the cake is completely cooled they can be stored. These cakes will last until the next season.